Posted May 19, 2010 at 3:10 pm in Complete Games, red sky. I’m starting to get quite comfortable working in Unity! Hopefully soon I’ll be ready to try making something a little more ambitious with it. Good to see this polished up a bit. Glad you kept the red atmosphere and red html background color. It adds so much tension for me to not be able to see the ground. Like exploring inside a gas giant thick with atmosphere. So much more horrifying to slip and fall into the clouds. Managed to make it all the way to the bottom of your structure. Not sure if there was something else but had a good time navigating this level. I did find a bug with your respawn code that sometimes it can place you in a wall–but not too often. It seems like you’re doing a lot of work in Unity lately. Just curious, how does it compare to Flash? I’m pretty happy with Flixel, but it’s always good to get a sense of what is out there. HybridMind: if you made it to the bottom, you’ve seen about 40% of the structure. Cool. Interesting seeing how the optical stuff compares with feign ( http://www.thegamescollective.org/index.php/topic,46.0.html ). Pretty cool use of colour. However, and I don’t know whether this was a design choice or a consequence or playing it online with Unity, but the elephant in the room problem was the horrible non-analog look. That is moving the mouse left and right wouldn’t rotate the view except at obscenely large increments. And I understand you’re probably not going to flesh this out further, but some sort of impetus or goal to keep going, like, I don’t know, text on the floors, would help a lot. 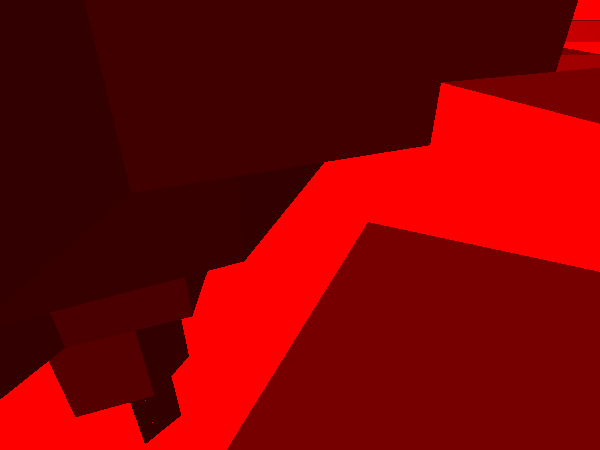 Nice work, i love how you brake the rules of “how 3D should be done”, Feign is great too for this, thanks Increpare. Oh, yes. Very nice. Loved the ‘ending’. I first wondered what the hell that thing was, maybe some sort of vehicle, until I was able to recognize the general shape of it. Nice! I loved the ending bit and how the 3d dynamics of the game kept me guessing of how to go on up till the very end. The terrain fading into the distance is gorgeous. I wish more 3d games would try to work with untextured surfaces. I hate Unity Web Player on Google Chrome. Back to the game; it breaks almost every rule in the game design book, and yet it’s compelling enough that I actually got vertigo at one point (specifically, climbing a floating staircase with massive gaps in it right over a crater that I’d been crawling around in minutes earlier). Wow. Very stylish. Lovely work. Hope to see you next Tuesday. Very cool. The mouse sensitivity is really high though, it’s not a problem when you get used to it, but I think most 3D game mouse users are used to making big movements with their right hand. Does unity support control for that? I find it annoying that there is no ‘invert mouse’ option anywhere in Unity 3d games, but oh well. i have a qustion, whats the point of the game, just explore? The game itself is decent. A proper ending might have been better if it had been done right, but it’s O.K. that it forces the player to stop and think about what it truly is. I keep getting stuck in the walls! Sorry about that, the respawning is totally broken, sadly. The problem is really simple too; I used ints instead of doubles, so it kinda snaps to a grid when it respawns, which is sometimes inside a wall. The much red made me feel dizzy, and see how my life is colorful! A very interesting little thing you’ve done here, Terry. It kind of occurred to me as I was playing through that it seemed to be a bit of a commentary on how arbitrary, as gamers, our rules regarding thinking about games are – for example, what we can walk on, what we know is a wall, what we know is open space. Kinda made me realise that, indeed, so are the rules of society, in a way. Great game! I don’t think I could contribute anything that hasn’t already been said though. Small minor issue though, with the respawn code it seems to be triggered when the jump button is pressed, for example: when I reached the top I jumped down to a lower level and while still holding the jump button I jumped in circles for a little while then jumped off the edge, I then respawned back on top of the level rather than where I jumped off. The jump sound also doesn’t trigger with each jump. I don’t know if that is intentional or a known bug, but if you didn’t know, you know now! But aside from that, awesome game! It’s not really that common to find FPS type games dedicated to platforming. Really interesting ending. Someone on Kongregate said they should open a ‘philosophy’ genre for their games, and yours would be in it. This whole game is a strangely disconcerting experience. its rather a good game , i just dont know the point. i reached to the end and i got a 3d map of the place. what should i do?